Looking for some fun this weekend? I suggest you head out to the Rock N Roll Marathon on Sunday morning. Watch 35,000 runners run from downtown Phoenix to ASU in Tempe. There’s live bands about every mile on both the full marathon (26.2 miles) and the half marathon (13.1 miles). I’m doing the half this year, so look for bib #32622. Then, head on over to Glendale to either buy tickets to the game or just enjoy the atmosphere at all the bars and restaurants right outside the dome. 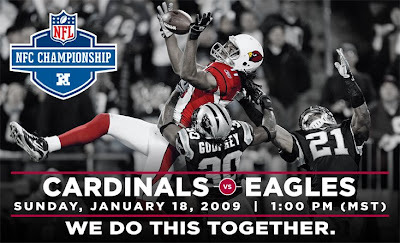 It’s the Cardinals and Eagles fighting to be a Super Bowl team. This is a first for the Cardinals and for Arizona. Go Cardinals. Then after the game, head back over to Tempe Town Lake to see Smashmouth. If you have a race bib, it’s free. I can just see smashmouth fans begging for the race bibs at the finish line.